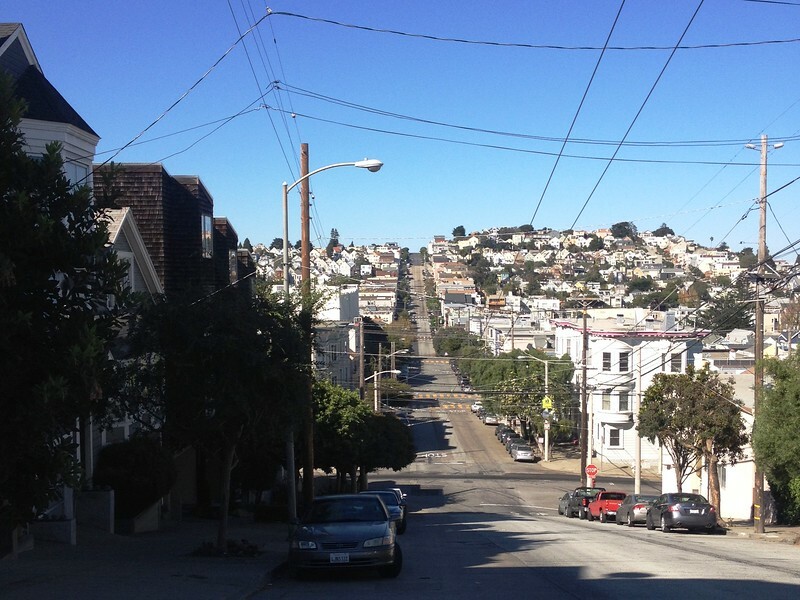 On the weekend James and I went to a house inspection near the border of Noe Valley and Glen Park. I checked it out on Google Maps and it was a straight line there so I figured why not jog there. This photo flattens the hills a lot but you get the general up and down gist of it. This was at about the halfway mark. It was almost so hard that it was fun. It definitely would have been fun if it hadn’t been so hot. James was a superstar and ran the whole thing nonstop (he was waiting for me at the end). The house that we were inspecting was cool – up a flight of stairs and hidden with no street frontage. This area was a little too residential (and the house will likely end up over our budget), but I still love the idea of secret houses. Afterwards we went to Billy Goat Park, which has killer views over San Francisco. 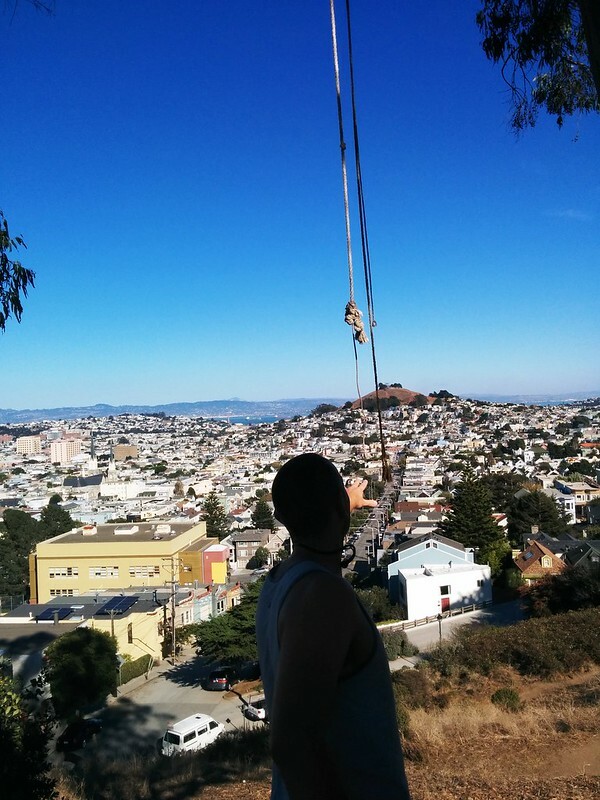 Apparently there’s normally a swing but someone had cut it down and there was just a rope. This is James retrieving the rope before we realised it was too short for swinging Tarzan-style. I think James maaaybe could have managed it (I had to get on my tippy-toes and could only hold on to the very end of the rope) but he’s scared of heights. At least we had plenty of time to enjoy the view! I didn’t have it in me to jog home so we just kind of meandered and admired the different houses. We passed two lemonade stands and a bunch of elaborately decorated houses for Halloween. 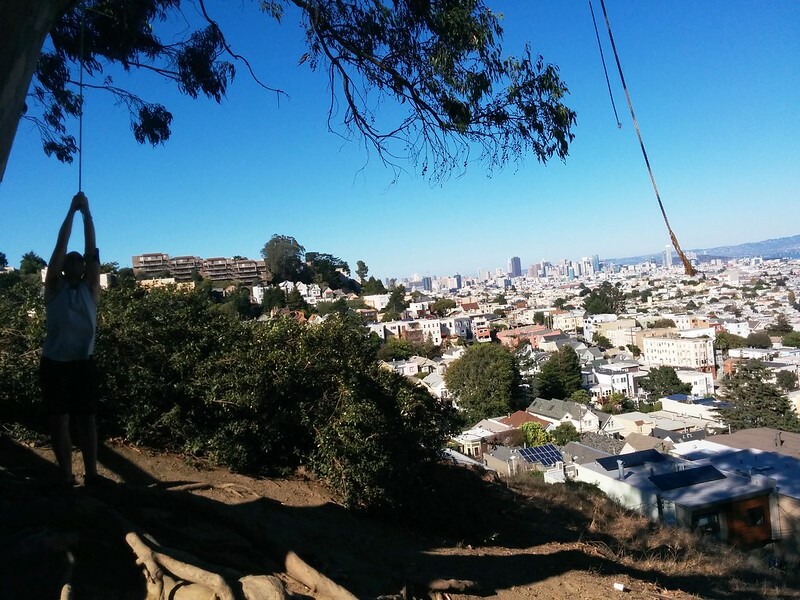 I can see why Noe Valley and Glen Park are popular with families! Oh yeah, and the promised update about the Dolores Park condo. As predicted we weren’t the highest offer. I don’t know what it ended up selling for because it’s still pending but apparently we were equal 4th out of 6 (and there was a big gap between us and 3rd place). James and I are inspecting a rental property in Mountain View on Wednesday so we’ll see how that goes.